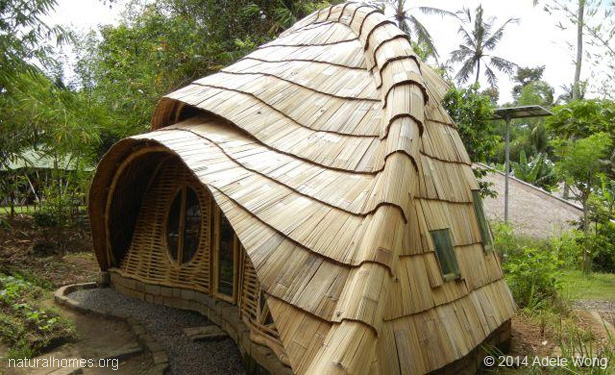 Natural Building with bamboo, clay, stone and thatch in Bali. This is the Green School in Bali. It was founded by John and Cynthia Hardy. It's a place where kids are taught about their relationship with the earth that they depend on. 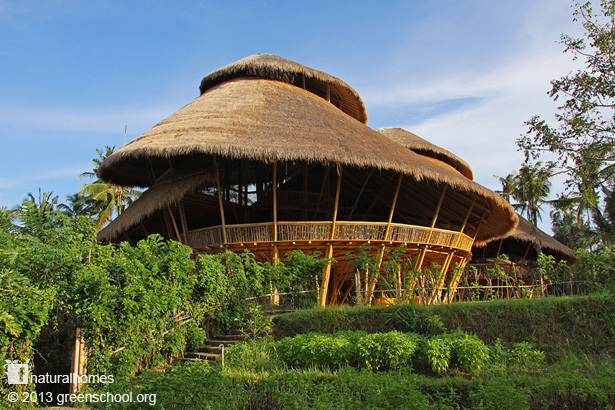 The school is built from bamboo. 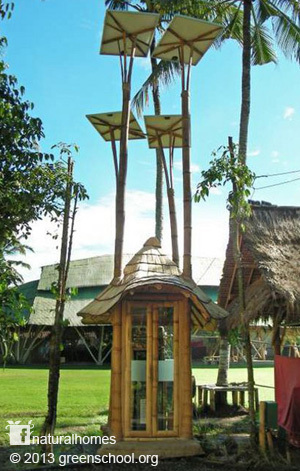 One of the keys to the Green School's construction was the earlier work of Linda Garland, founder of the Environmental Bamboo Foundation, an Indonesian non-profit organization that protects tropical forests by promoting bamboo. The foundation did the all important research in to finding a way to protect the bamboo from the destructive Powderpost Beetle. Bamboo has a high silica content which makes it difficult to digest by beetles but by soaking the bamboo in borax salts (guideline) it becomes a reliable building material. Now add designer Elora Hardy, John and Cynthia daughter, and some wonderful imaginative spaces start to take shape. Elora founded the bamboo construction design company Ibuku, meaning 'mother mine' or mother earth. Here Elora talks about her story and the homes she designs with bamboo. Green School is home to some wonderfully organic shapes all made from bamboo, stone, clay and grass. Select from one to six below. The Green School is now 100% off-grid, powered by solar panels and a vortex generator that borrows water from the river creating a vortex to generate 50,000KWh of power over a shallow fall of about 80-100cm. Below is the school's bamboo ATM. Normally these would be powered on-grid but this one has its own solar panels and is bolted to a large stone rather than the conventional concrete block which the school would not allow. In keeping with the school's environmental mission it was the venue for the release of four breeding pairs of the endangered Bali Starling (right). 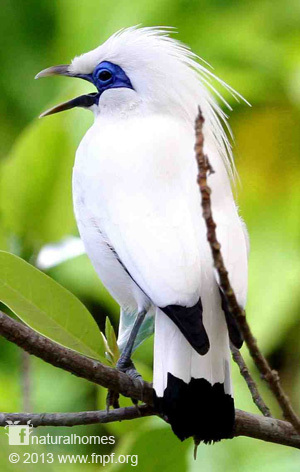 The Bali Starling became the rarest bird in the world because of its value, around $1,000 each, for the pet industry. Despite the release of the starling it is still critically endangered because it has an extremely small range and a tiny population, which is still suffering from illegal poaching for the cage-bird trade. The Green School partnered with The Begawan Foundation and the community to release four breeding pairs [release pictures] of the Bali Starling. Listen to Bayu Wirayudha's story (below) of his efforts to protect the beautiful bird.